Season the cooked couscous with salt and pepper. Dip the pork chop in egg white, then coat each side with 2 tablespoons of couscous, pressing into a thin layer. In a skillet, heat the oil over medium-high heat. Add pork chops and cook for 2-3 minutes per side or until golden brown. Remove and drain on a paper towel. Squeeze half a lemon evenly over top the four pork chops. Place one pork chop on the bottom half of each sandwich skinny. 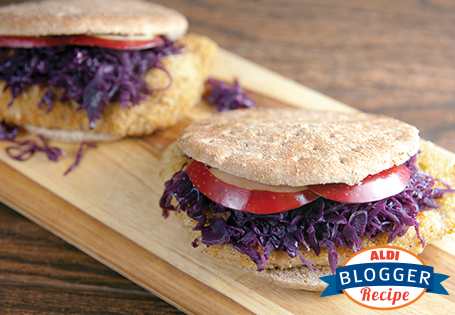 Spoon equal amounts of cabbage onto each sandwich, then top with apple slices. Cover with remaining half of sandwich skinny. For more crunch, increase the couscous to 2 cups.